Prologue action: Will is gathering some shady Downworlder drugs from a ghost in a cemetery so he can bring it to Magnus Bane, the warlock who is trying to summon a very specific demon at Will’s behest. Charlotte and Henry are on trial for the way things went down at the end Clockwork Angel—going after de Quincey, letting Nate get away with the pyxis, ETC. ETC. Benedict Lightwood doesn’t think women can run institutes, and challenges her role all official-like. Consul Wayland gives Charlotte two weeks to find Mortmain as a final test to save her position, and charges Benedict’s sons, Gabriel and Gideon, to train the staff and Tessa at the Institute to fight and defend themselves and the institute. The Shadowhunters find a lead to Mortmain that sends Will, Tessa, and Jem to Yorkshire. They learn that Mortmain’s parents were warlocks, and in the days before the Accords, Shadowhunters killed Downworlders with very little provocation. When they found out that Mortmain’s adoptive parents (Warlocks can’t have bebes) were working on making clockwork creatures, they moved in and killed them. Mortmain has borne a grudge against the Nephilim ever since. While in Yorkshire, Will, Tessa, and Jem wind up investigating a country home they believe belongs to Mortmain. But WTAF!!!! THEY FIND WILL’S FAMILY LIVING THERE INSTEAD. Will never talks about his family, but Tessa and Jem know that he left them to join the Shadowhunters after his father had been thrown out for marrying a mundane. He’s SUPER estranged from them. Will sees his sister outside, Cecily, and runs after her, only to be chased by an automaton who tells the three of them he has a message from the Magister: to back off OR ELSE. Apparently Will’s family has some connection to Mortmain. Will and Tessa’s relationship is strained. She’s growing MUCH closer to Jem. In fact, Tessa and Jem have a pretty hot make-out on Jem’s bed, even though Tessa remains confused about her feelings for both of the boys. So that demon Magnus is trying to summon for Will? Turns out that when Will was young, he released a demon from his father’s pyxis, and the demon cursed him, saying that any person who ever loved him would be doomed to die. His older sister saved him from the demon, who escaped, but she died the same night. Will believes his curse will kill people who love him, so he keeps everyone at arm’s length. But because he LOOOVES Tessa, he wants Magnus to summon the demon so that he can break the curse. The Shadowhunters learn that Jessamine has been sneaking out of the house at all hours dressed as a boy. Sophie finds her one night with an invitation to a party at the Lightwoods. She was invited by…NATE, who we later find out is HER HUSBAND. Will and Tessa go to the party with Tessa as Jessamine. She finds out lots of stuff from Nate about the Magister’s plan. She also makes out with Will. Like, a lot, and she REALLY enjoys it. Later, Will sees the demon he’s been trying to summon at the party and chases after it. Charlotte has Jessamine thrown in Shadowhunter jail for working with Nate. The Silent Brothers take her. She eventually helps them lure out Nate by setting up a meeting with him at Tessa and Jem’s request to turn over Mortmain. Nate responds to Jessamine’s summons to a meeting. Charlotte, Henry, Will, Jem are there; Tessa has shifted into Jessamine. Nate brought an automaton with him who he sicks on Tessa-as-Jessamine. FIGHTING ENSUES. Will blows the automaton up and uses his body to cover Tessa’s. Nate dies in the explosion, and Will is gravely wounded. Benedict Lightwood is in league with Mortmain. Mortmain wants Charlotte out at the institute so he can install benedict lightwood as his puppet. Charlotte and Co. find out that Benedict Lightwood has demon pox and that he gave it to his now deceased wife bc he likes the demon ladies and Mortmain has been giving him drugs to slow the progress of the disease. 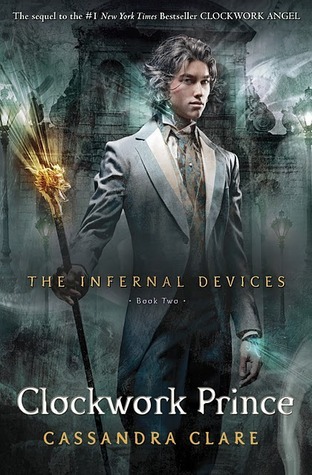 One of his sons, Gideon, defects to the Institute (he’s got a thing with Sophie) and Benedict agrees to withdraw his challenge for the head of the institute when Charlotte threatens to rat him out to the Clave. …Jem PROPOSED to Tessa. 0_0. He professed his love and asked her to marry him and Tessa accepted. They agree to keep it a secret for a little while, although they both tell Will, who is CRUSHED. The Shadowhunters are enjoying a spot of good times. Charlotte has been cleared of any wrongdoing by the Clave and is pregnant with her and Henry’s first child, Jem tells everyone that he and Tessa are engaged, and Gideon is living at the Institute and making eyes at Sophie over his dinner plate. The only bad times? The meeting of the clave is attacked by Mortmain’s automaton creatures and one of them seems to recognize Tessa. Will’s younger sister, Cecily, shows up at the Institute for Shadowhunter training. Also, of course, Mortmain is still on the loose. Demon pox: basically a demon STD. amazing work girls!! Thank you, once again! !